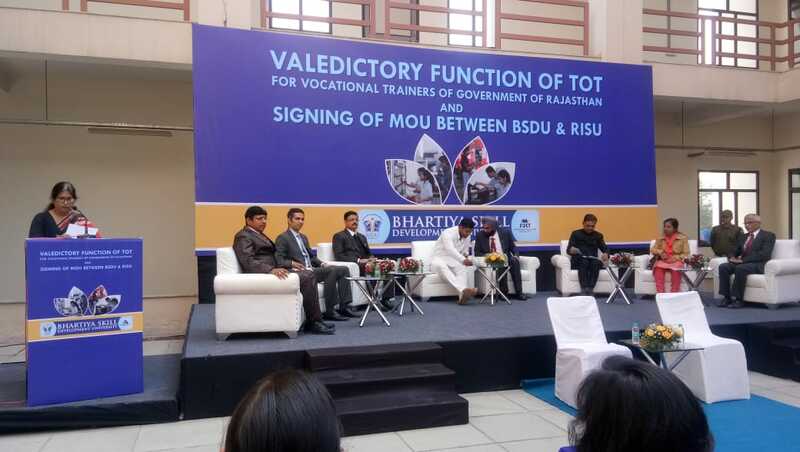 Memorandum of Understanding (MoU) was signed by Bhartiya Skill Development University (BSDU) and Rajasthan ILD Skills University (RISU) on occasion of valediction ceremony of around 200 trainers who have participated in training of trainers from 11 districts of Rajasthan. With an aim to promote more effective use of universities’ resources and provide students with enhanced opportunities, BSDU has signed this MoU with Rajasthan ILD Skills University. Dr. Lalit K Panwar IAS, VC of Rajasthan ILD Skills University and Dr. (Brig.) Surjit Singh Pabla, Vice Chancellor, BSDU validated the objectives highlighted under the MoU along with other dignitary guests.